Ideal for the constant traveler, the PXC 310 BT headphones from Sennheiser provide high-quality sound and active noise cancellation in a compact and wireless design. Bluetooth 2.1 wireless technology allows you to listen to Bluetooth-enabled audio devices without the tangles of wires. The patented Duofol diaphragm technology and neodymium magnets produce clear, crisp sound with a wide frequency response. The thickly padded earcups fit snugly on the ear to naturally block out noise, and when combined with the active NoiseGard 2.0 technology, provide a pure listening experience with up to a 90% reduction in ambient noise. 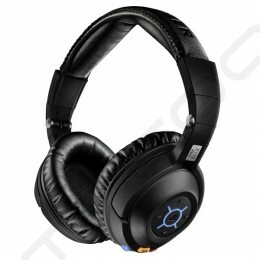 The headphones have a TalkThrough function that allows you to hear those around you without taking off the headphones. Built-in track skip and volume controls make it easy to make adjustments to audio playback. The headphones operate on a rechargeable lithium polymer battery for up to 20 hours, though a bypass mode is available that allows you to use the headphones without noise cancellation features, ensuring that a dead battery doesn't leave you stranded without audio playback. A USB charging cable and multi-country wall charging adapter are included. In case you want to go for standard wired use, a single-sided detachable audio cable is included. The cable has a standard 3.5mm plug, along with 1/4" and airplane adapters, letting you connect to MP3 players, CD players, home stereos, in-flight entertainment systems, and more. The headphones fold down for convenient storage in the included carrying case.